Angus Soutar is the school Principal and founder. Angus has 25 years experience in teaching the international (72 hour) design certificate course (PDC). He has studied with some of the most senior permaculture teachers, including Bill Mollison. He was awarded the Diploma in Applied Permaculture Design by the Permaculture Academy (Britain) in 1997. 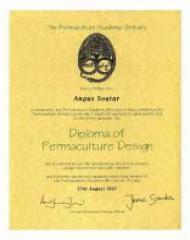 Angus is accredited by the Permaculture Research Institute to teach the PDC, worldwide. Angus is a qualified permaculture designer with over 22 years of work in applying the skills, experience which he makes readily available to assist any of the students on our courses.